Up early, it would have been earlier if Tilly had had her way! A mug of tea each and a bowl of cereal we pushed off to the water point to top up Oleanna’s tank. Because she has a bowthruster our water tank is quite a bit smaller (500L) than Lilllian’s (800L) but we no longer have a flushing toilet so we should save quite a bit of water there. At the moment it looks like we get through around 100L a day, almost a quarter of the tank, we have a gauge now! Once full we pootled through the swing bridge and on to Oleanna’s birth place, Mick beeped the horn, it really is loud! The chaps at the yard couldn’t ignore it and most came out to wave us goodbye. Johnathan wished us well as we passed and we thanked him. 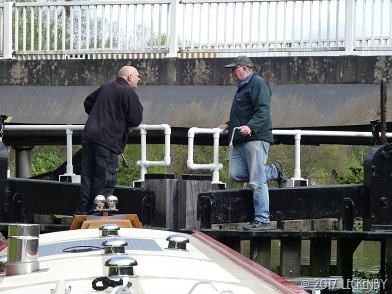 No time to stop, we had a rendez vous with a Lock Keeper. As we reached Shirland Winding Hole Mick gave Oleanna a bit more umph to make sure she wouldn’t just slow and turn around. From here on it is new water for her. That’s better a changing view again! The top lock of the flight was open and ready for us, Mick brought Oleanna into it and then stepped off, she was all mine now for the flight. The Lockie asked how long we were, 58ft 6in is what we asked for and hopefully are. 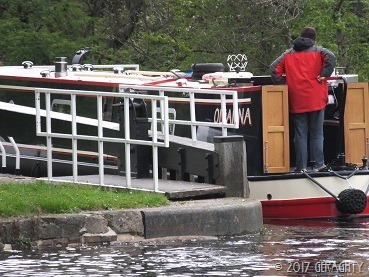 Once Oleanna’s bow was past the walkway on the bottom lock gates I could nudge her further away from the cil markers. There is only one cil that you actually get to see on this flight and that is at lock 7&8 which is deep. She is that bit easier to drive than Lillian, the morse control is less stiff and she responds quicker. Although I do seem to be developing a certain stance whilst looking down the port side of her. Lillian has no back doors on the cruiser stern, Oleanna does, so even though opened fully there is a bit less room for me to stand out on the back and be able to move the tiller. 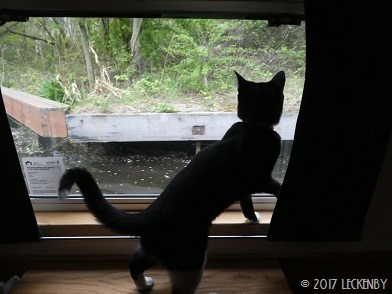 So I have to stand and lean backwards to see where the gunnel is compared to lock gates. This may change in time especially when my right foot is better. 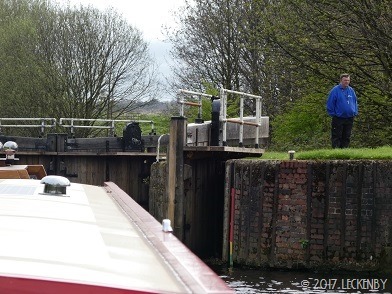 David saw us down the first section of locks. He had an electric bike which he rode back and forth up the main section of the flight. All the locks have to be unlocked then locked after we’d gone through. He was quite chatty and although he spends his days unlocking locks and replacing signs that have been shot at he feels lucky to have a nice flight to look after where he gets no bother, “I can just look after you boaters”. He waved us goodbye after Lock 9. Under the M1 to Lock 10 Mick took over the helm to let me sit down for a few minutes. Here Gary was waiting for us a second Lockie. As Mick stepped off I warned him that this was the chap who just opens paddles as soon as he gets to them without checking to see if you are ready. 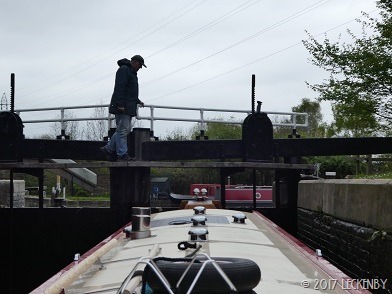 He drove his van down to the next two locks and then waved us goodbye at the bottom lock of the flight. 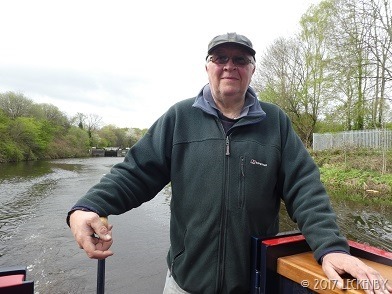 Mick took over the helm again along the river section. The next lock is a flood lock and last year we were left to operate it ourselves, but it is now kept locked so we were met by Nigel our third Lockie of the day. 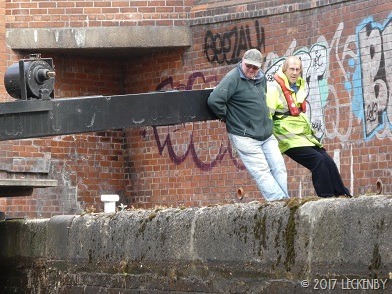 He said to stay on board and he’d work us down which he also did at Holmes Lock, giving me chance for a longer sit down. 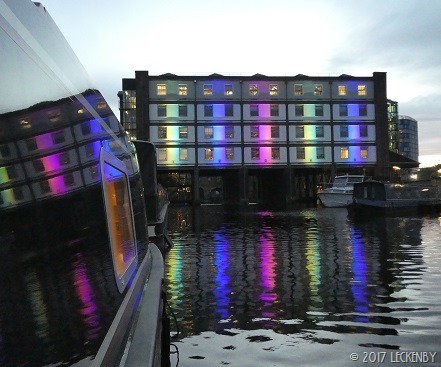 Now on our own we pootled on to Ickles Lock. A Humber Keel had taken up residency on the lock landing, very helpful on a windy day! No option but to drop mick off on the offside. 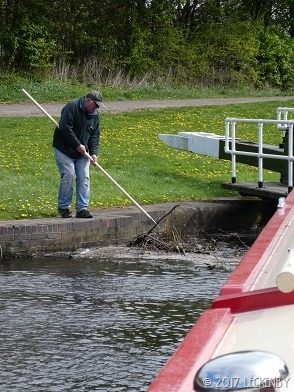 The mouth of the lock was full of rubbish, Mick tried to open each gate but had no luck. So our boat hook was employed for the first time to clear enough rubbish so that the gate would open. This was of course the side that was partly blocked by the Keel. 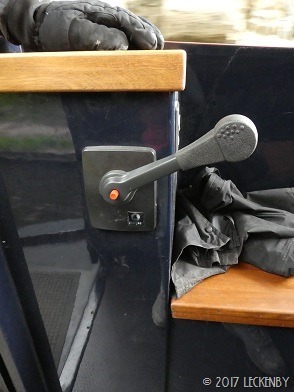 The girlie button came in useful to achieve the steep angle that was needed to get into the lock. 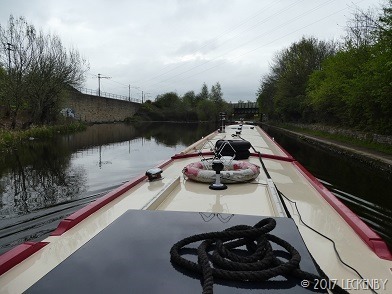 Rotherham Lock was also surrounded by rubbish and the wind was doing a good job of holding Oleanna into the side. I managed to get her into a good position but too early as the lock wasn’t set so had to back up even more to swing her round through all the footballs and beer cans. 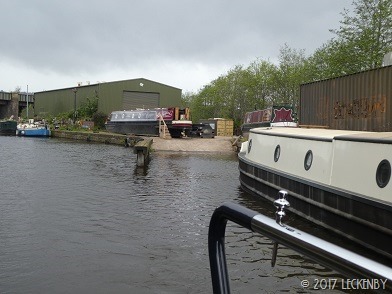 Once through we decided that we’d pull up for some lunch and remove whatever had wrapped itself around the prop, we continued on to moor above Eastwood Lock. 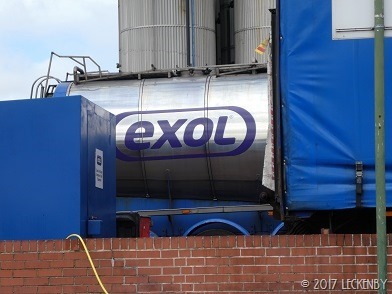 Mick had asked David where Exol Pride was at the moment, this is a large commercial barge that works between Rotherham and Hull, you know when it’s coming your way! We were in luck as it had left Rotherham this morning, it was unlikely that we’d catch it up. The wind got stronger and stronger which didn’t seem to bother the swans at the huge winding hole, but it was starting to bother us as white horses were showing their heads. We pulled in and had some lunch hoping that it would calm down. But it didn’t. Our aim had been to go for at least another hour before mooring up for the day, maybe even get as far as Sprotbrough. So we’ll have to make up time tomorrow with an earlier start than planned and hope that the wind is kind to us. Several jobs have been seen to this afternoon whilst I’ve been resting my foot. Mick has solved a problem we’ve been having with the freezer. 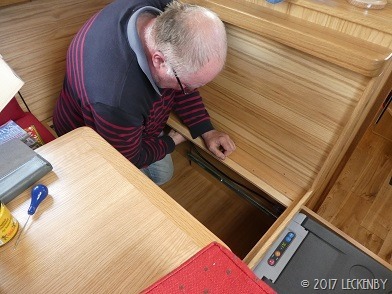 As you pull the drawer out the cable was getting caught on the drawer runners and pulling the spade connectors out. A small cuphook screwed to the underside of the frame now holds the cable up out of the way. He has also crafted lengths of hose so that we can now empty our yellow water tank (wee tank). We have a 20 L tank under the floor in the bathroom where the urine from our composting toilet goes to. There is a gulper pump to help empty the tank which has an outlet on the gunnel a bit like with a pump out, except we pump out ourselves. The system has been tested and our tank is now empty. 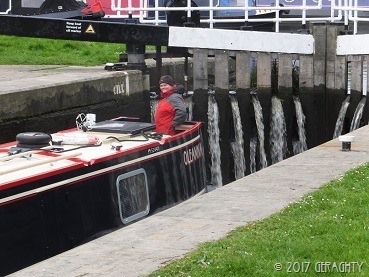 15 locks, 7.42 miles, 1 swing bridge, 1 BIG THANK YOU to all at Finesse and Jonathan Wilson, 1 emotional moment, 3 lock keepers, 1 maiden voyage, 1st spotting, 3 gunnel scuffs! 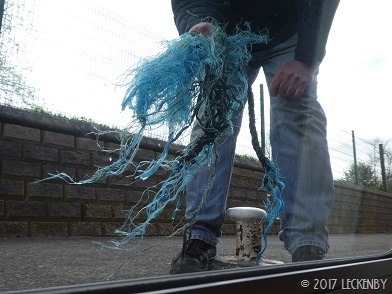 2 much rubbish, 1 leaning helmswoman, 3 open drawers, 1 outside moved, 0 exol pride, 49 swans, 2 much wind, 1 early stop, 1st trip down the weedhatch, 2 wee hoses, 1 Tom in a drawer, 1 freezer sorted, 0 fire irons, 2 grins. ooh I've been studying the map and see you're heading north east. Do you have a Grand Plan? 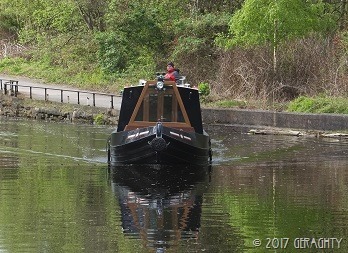 Waterways are getting busier now, even in the wilds of west yorkshire where for half the year nothing stirs. Traffic moving freely between Elland and Brighouse now after the long, long stoppage for 2 collapsed bridges. 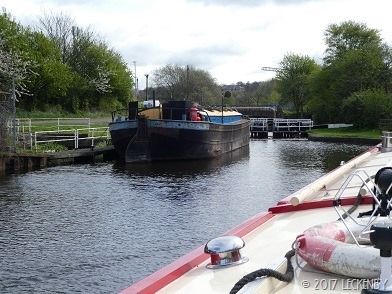 Glad to hear that boats are moving again up at Elland. 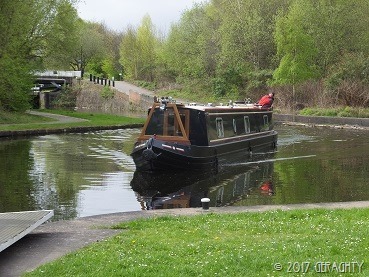 We're wondering if we are about to run into loads of boats moving over the weekend as we haven't seen a moving boat since leaving Sheffield.We'll start heading southwards on Saturday back to Crick, then on to London for a bit, after we've finished sorting out Lillian. After that the current plan is back northwards. all the waterways have their different flavours don't they? Where you are at the moment sounds unlike what I'm used to. 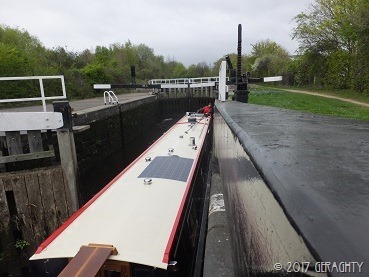 The first time I ventured onto a big -lock navigation I was dead excited. That was Castleford. Much more used to the entirely leisure routes. There's some bits over on the west side of the pennines that go through large factory premises. I love it all, I'm like a little kid, look mummy, look!